Financial news site Bloomberg reported on a rumor about an activist investor sniffing around eBay, pointing to a report 2 weeks ago from TheDeal.com that apparently cited a single source. Activist investors can wield tremendous influence, as former eBay CEO John Donahoe learned the hard way. In January 2014, companies controlled by Carl Icahn acquired enough of an economic interest in eBay to pressure it to spin off PayPal. Readers know who won that fight, even as they continue to deal with the fallout known as eBay managed payments. Etsy also learned the lesson last year when the activist-investor hedge fund Black-and-White Capital LP called on Etsy to explore a sale. While Etsy didn't sell itself off, it did replace CEO Chad Dickerson with former eBay executive Josh Silverman. Etsy's board left it to Silverman to make major changes to keep the pressure off - extreme cost-cutting that included layoffs, and outsourcing technology; slashing programs; and greater monetization (including raising fees in July). We took a look back at Silverman's 1-year anniversary in this May article. And would an activist investor look for eBay to better monetize its site through fee changes? Are investors concerned about eBay managed payments' initial year-long exclusion of PayPal? The rumor alone of an activist investor lying in wait could get eBay's board of directors mulling ways to stave off a possible advance. Whenever an activist investor enters the picture, it's an implicit criticism of the CEO and board - it's saying in effect that it doesn't think management and the company's board are doing enough to maximize the value of shares for investors. Neither John Donahoe nor Chad Dickerson survived the entrance of activist investors during their tenure. The questions for readers: are eBay and Etsy sellers better off after past moves by activist investors? 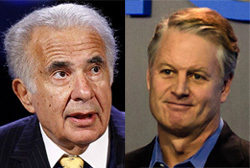 Could eBay survive a Carl Icahn sequel? Could sellers? Certainly, these days, eBay has all the markers set for it to happen. Incredibly poorly managed being an understatement along with their own thievery with stocks and their own customers, their sellers. I'm sure ICahn is well versed on their activities. ICahn is a very impressive businessman. I don't think he got there by making a decision such as this. I just somehow can't see it happening. I honestly just think that eBay probably put that plant out there to get their stocks up to purge one more time before the results of Q3 are released. If I may add, one of eBay's shills released that information at 10 this morning on Yahoo Finance, well before the Bloomburg column was released. Could just be coincidence though. ANY kind of outside eyes on eBay can only be a GOOD thing. Icahn would "want to know" DETAILS of eBays income and that scrutiny would be good for everyone involved - except the mob bosses at the top. Sunlight is the best disenfectant. Please, please...someone remove the kitchen sink numbers from ebay's GMV. Their GMV is beyond gross. I have to second your opinion on a possible ebay inspired leak. Too much coincidence on the eve of 3rd quarter results. Looks like the "smart investors" took a $20M bath today. Somebody made a lot of money off this rumor being floated around today. Could have been Icahn himself. But I wouldn't put it past eBay tossing it out there to drive their stock price up a bit to keep the decline in check. I am not sure eBay, as it stands today, will survive anyway. Carl Icahn, love him or hate him, is interested in himself. If he can make money breaking a company into little pieces, he will. The impact on sellers is the least of his concern. So to that end, it would be no different from where we are today. Ebay management is interested in themselves and have little concern toward sellers. I am sure a lot of people have sharpened their focus onto eBay lately. The stock is down, outlook is not positive, management is ineffective. There is a lot of room for improvement and a lot of value that can be realized. @ebayout "Too much coincidence on the eve of 3rd quarter results. Looks like the "smart investors" took a $20M bath today."" FastMoney is conducting a Twitter survey on Pete Najarian's rosy optimistic eBay outlook resulting from this mornings options calls and activist speculation that drove up $EBAY today. This may be a good opportunity for those with opinions they'd like to share (pro and con) to get a bit of exposure "in the wild" to the general public and investors that have no idea what eBay's true customer experience is really like. Also, a Twitter account takes all of 45 seconds to set up if you don't already have one. Don't forget to follow @EcommerceBytes if you don't already. Ina posts a lot of interesting things in addition to the ECB articles.. Agreed on the previous stock opinions. eBay has been pumped for weeks by all the outlets and then comes this news that's nothing but but rumors. Convenient timing for eBay isn't it? Insiders will take profits yet again and the stockholders will be without a shirt on their backs. eBay scams everyone including the stockholders. I'll also add that since eBay is run by a den of thieves (lawyers) I'm sure they've got a loophole for pump and dump accusations. Just like that they have a loophole for every scam they run against sellers on the site. Despicable crooks. eBay won't survive unless someone with e-commerce knowledge and a serious plan to make eBay relevant again takes control. We constantly discuss what needs to be done to help eBay and its sellers make money, but someone needs to step up and get it accomplished. Remember how a few months back someone predicted that eBay would be history in five years? That time frame keeps shrinking with every passing month that Devin is in charge. Ebay is not going to grow anymore then it already has, and in reality how much can they squeeze from their dwindling seller and buyers, a few percentage points will not be enough, ebay is in decline, it's glory days are long gone, completely overrun by Amazon and millions of owner operated websites, in fact most business's now have their own sites, ebay is like the wagon wheel, you just don't need them anymore, soon to be obsolete. ebay continues to blame others for their troubles, but it's to be expected, I'm sure the wagon wheel makers blamed rubber tires for their decline too. I want to say it was a smart move for PayPal to go its own way (even though Donahole went with it). But the truth is I never use PayPal outside of eBay. ToysRUs offered it at checkout and it never worked. That said, maybe I just don't get it. I've watched those little white Square Readers practically disappear from conventions. Yet that stock broke $100 recently (it IPOed under $10 in late 2015). So who the heck knows what's going on. You have plenty company in not knowing what's going on...all those newly minted ebay shareholders from yesterday have joined you. Hard to believe that even bottom feeders are still buying today.